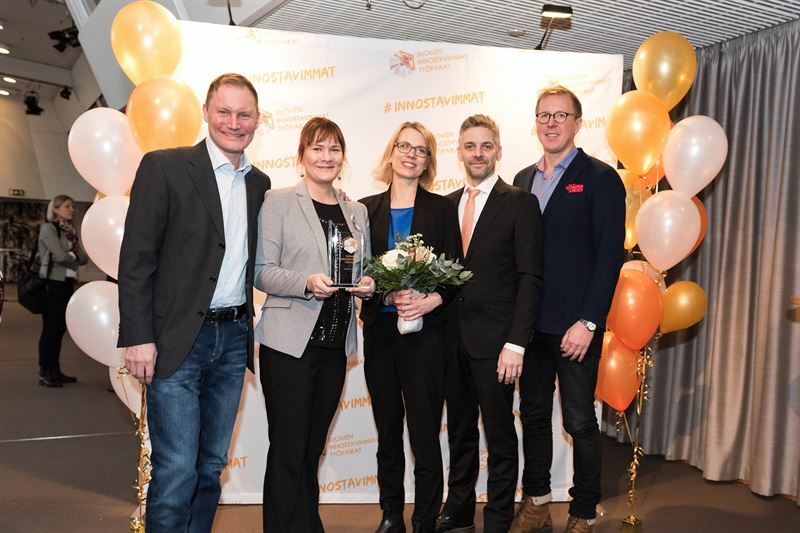 Paf (Ålands Penningautomatförening) has won the “Most Improved” award in “Finland’s Most Inspiring Workplaces 2018”. This means that Paf has been able to improve its employee survey results the most, compared to the previous year. In addition Paf is one of Finland’s Most Inspiring Workplaces. The awards are presented by Corporate Spirit Ltd, the market leader within the field of employee surveys in Finland. Annually hundreds of organisations and tens of thousands of employees participate in their employee surveys. - This feels great! On behalf of the organization and all employees I feel both proud and humble. This is a recognition that all our employees have contributed to, says Paf´s Deputy CEO Daniela Johansson. The Finland’s Most Inspiring Workplaces listing, and specifically the Most Improved acknowledgement means that Paf has invested in developing the organisation by listening to its personnel’s perspectives on meaningful subjects in the organisation. The employees are inspired, motivated and committed to work towards a common goal and to grow the business together. Paf´s employees participate in the survey annually, in late spring. - When the result is analyzed we take action to improve, especially focusing on the areas most in need of improvement. A lot of the follow up work is done by the employees in small teams, says Daniela Johansson. Clarified strategy and priorities. This has resulted in a better focus and improved the sense of achievement among the employees. Improved communication. For example live monthly info sessions are arranged for all employees and a new interactive intranet has been launched, providing a space where employees share insights, project info, success stories and more. These are the tools that allow us to build Paf pride and learn about other parts of the organization, eventually leading to better understanding of our own role in the big picture. Daniela Johansson emphasizes the importance of all the things employees do in their everyday work; how they support each other and cooperate with each other. - Basically it is all about continuous work that has been taking place over several years. Our goal has been to use the employee survey results and take action on all levels in the company in order to make improvements and create engagement among all the employees. The organisations with the best results were awarded at an event in Finlandia Hall in Helsinki 6th of February 2018. Pictured here are Mikael Svartström, Paula Pennanen, Daniela Johansson, Anders Sims and Tuomas Bergström, who all represented Paf at the award ceremony. Paf was founded on Åland in 1966 with the clear purpose of creating profit to support public good. This is still the company’s primary purpose. Today Paf.com is an international gaming operator with over 200 games including slots, casino, poker, betting, bingo and lotteries. Paf also operates a large physical gaming operation on land and sea with about 1,500 slot machines and 55 gaming tables on ships in the Baltic Sea, in Paf Casino on Åland and Casino Sunborn in Gibraltar. Paf offers safe and socially responsible money games that give players pleasure and entertainment. In 2015 the Paf Group had a total revenue of 110 million euros producing a profit of 22.7 million euros. The contribution to public good was 20 million euros. The group has nearly 400 employees, is headquartered in Mariehamn on Åland and serves players from countries including Finland, Sweden, Estonia, Spain and Italy. Paf is licensed and controlled by the local Åland government. More information can be found at www.paf.com.